Wrap Around Decks on three sides, Views every room, quiet and private. The Views are Breathtakingly beautiful. From the spacious pool deck you can see the entire Bajia Banderas, from the Malecon to Los Arches. The Masterbed room looks over the Bay toward Puerto Vallarta. i enjoyed the spectacular New Year's eve fireworks from the king size bed, with a glass of Moet. And the pool is private...bathing attire not required. Enjoy the evenings cocktail and watch the sunset while floating in our salt water filtered pool. And yes, it is solar heated, so crank up the heat all you want without leaving an enviromental footprint. The Villa was built in 1980 by the famous PV architect, Giermo Wulff. With high beamed ceilings, soaring windows with beveled glass and huge folding glass doors to the patios. It has been recently renovated, so all the floors and counters are granite. All the kitchen appliances are state of the art with a Viking gas stove. And a pass through counter to the pool deck making outside dining a pleasure. The spacious living room enjoys the sweep around views and opens to two decks, one to the pool and the other to a smaller balcony where we enjoy breakfast. The bedroom are spacious and the ensuite bathrooms are granite. We are located 10 minutes from the best part of PV, Old Town or also called, the Romantic Zone. And if you are looking for a quiet, peaceful place for a vacation or to celebrate a special time in you lives, Villa Serena is here for you. The beach is a five minute walk down the hill. Also the adjourning resort has three restaurants open to the public, for breakfast lunch and diner. Over the years we have had many happy guests please take a moment and read our reviews. Occupancy is based on a maximin of one couple. The pool is solar heated and salt water. The rate quoted by VRBO is not always accurate due to their automated service. And also because we offer many extras for a fee like a cook, food stocking and airport arrival pick-up, in house massages. Maid service is once a week and additional days can be arranged for $25 a day, We will be available to discuss your personal needs and answer any questions, so contact us directly. We have the perfect balance of lifestyles, Aspen in the Summer and Puerto Vallarta in the winter. Clear blue skies, sunny days every day and spectacular mountains in Aspen. And when the snow flies…..the beautiful Pacific Ocean with the humpback whales breaching in front of our balcony. And when you are ready to leave the peace and quiet of our Villa, Puerto Vallarta's, Romantic Zone or Old Town as the locals call it, is 10 minutes away. Over 400 hundred restaurants with a wide variety of cuisines and price ranges. If you are looking for something above the ordinary, Villa Serena is for you! If you want a romantic get-a-way, Villa Serena is for you! if you want to recharge your batteries, Villa Serena is for you! If you want the best views of the ocean, Villa Serena is for you! If you are looking for one of the best boutique villas in PV, Villa Serena is for you! Quiet AC in every room, kitchen, dining, living, master suite and bath. 2 Balconies with hammok, dining table and lounges. An incredible villa with a breathtaking view. We absolutely loved our stay at Villa Serena. We arranged for dinner in our first night and Janet arranged for the fridge to be stocked which we highly recommend. The whales put on quite a show while we were there. 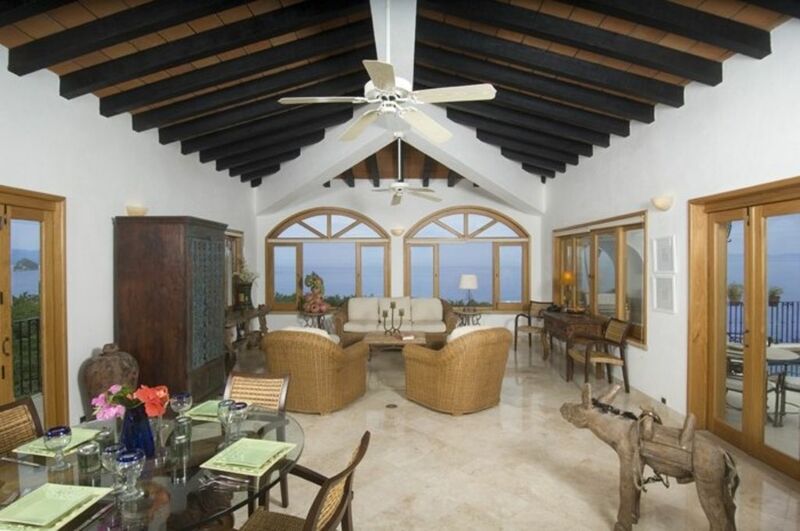 The villa is designed to capture gentle sea breezes and the view is spectacular from every vantage point. Day trips to Jelapa, Mismaloya and PV were easy - buses run frequently and stop outside the villa. When we weren’t in the pool, we used the public beaches which are about a five minute walk away and preferred the one to the right. Janet was great to deal with and Elba made us feel very welcome. This property will not disappoint! Thank you for your wonderful review. We are very gratified when a guest appreciates Villa Serena. The villa is our home and not a rental unit, so we make sure you have all the comforts to insure the perfect vacation. And the views are the 'Best in PV". We have had many a film crew out on our decks to capture the 270 views of Los Arcos, Los Muertos and Punta de Mita. We can boast that you can see the Bahia from every window in every room...even the shower! We limit our rentals to just a few weeks a year and we are thrilled that you enjoyed your stay to the extent. Our family very much enjoyed Villa Serena. Everything was as advertised and the place was very comfortable and very clean. The property manager, Elba, was also very accommodating in helping us with all our needs including setting us up for the best massages we have ever had! The view from the villa on December 31st was spectacular as the whole Baja de Banderas lit up with fireworks at midnight. We would recommend this villa to anyone. Thank you Christopher. We are pleased that you and your family enjoyed your stay. We try to make sure our guests have everything they need and Elba is my secret weapon, she wants everyone to be happy. And yes, our Villa is the best place to view the fireworks all up and down the Bay. Villa Serena is a private retreat - you won’t want to leave! Unbelievable views, beautifully furnished, safe and completely private. Have all of the luxuries you enjoy without having to share with anyone! Old world Mexico with all of the modern comforts. Close enough to town and amenities that you can experience them but then quickly escape back your private villa. Or maybe just stay in for the day! We had a wonderful time disconnecting from our busy work life and reconnecting with each other. Imagine an evening swim in the private pool looking at the stars and fireworks over the city. Perfect! Imagine your morning coffee with the birds starting the day from the jungle to the ocean; parrots, magnificent frigatebird, pelicans - all from your breezy master bedroom opening onto the deck! Xanadu! Janet is wonderful host and has an excellent team to help make your stay, truly, a dream! Thank you!! Thank you Makenzie for your wonderful review. My husband and i are always happy to know that our vacation guests enjoy our home. It is the perfect place to renew your spirit, refresh your mind and restore your energy. It was my staff and our pleasure to make your stay as perfect as possible. This property is perfect for a family of 4! We had 2 bedrooms and two bathrooms, with plenty of space to lounge indoors and out. The pool was a big hit for the kids, dad loved to sit outside (mountain-side) and watch the tropical birds fly almost at eye level, and I loved the window by the kitchen sink that opened to give me views of the ocean. The water pressure was nice and strong in the showers, and the house looked exactly as presented. We never saw a mosquito and never needed air conditioning! Housekeeping was great as well! Location was perfect - we could call for a cab or walk downstairs and grab the bus into town (which the kids loved!). We were close to the zoo, the botanic gardens, the beach was right across the street, and town was 10 minutes away. We usually hit the beach in the morning and strolled the malecon at sunset. We are looking forward to visiting again next year, this place is a gem! Thank you Janet for all your help with my questions, it was geniunely the perfect vacation! Thank you for taking the time to write such a nice review. We are so pleased that your family enjoyed our home and all the special features that our villa offers. I like the birds flying at eye level part. We hope to see you back here someday! You really won't want to leave the pool and deck overlooking the ocean. Comfortable and well equipped in every way. We didn't rent a car and found the buses were very easy to use to go downtown to eat and go grocery shopping. The one downside is that there are almost no restaurants or grocery shopping within walking distance, except for the restaurants (by the pool and inside) at Garza Blanca across the road. Beaches are marginal, but again, you won't want to leave the pool and deck. We ventured out to Mismaloya several times (great snorkeling, good beach and fun to watch the fishermen) and wished we had taken the boat to Yelapa (go to Mismaloya, the tours to other locations are cheaper than leaving from downtown). Everybody we worked with, from the owner, manager, housekeeper and pool guys, were friendly and accommodating. Unfortunately, the roof of the property on the other side of the pool was being repaired the last two days we were there. We would definitely come back here again. We are so pleased that you enjoyed your two weeks at Villa Serena. We as owners strive to fullfill our guests vacation dreams. And yes, the pool and the views are hard to leave. We appologize for the inconvenience of the work being done on the roof below. Had we known we might have had it delayed but thank you for understanding that there are some things that inevidably come up. Glad you found Mismaloya, it is a very soecial place that the locals enjoy and it is closer to the beautiful secluded hidden beaches that dot the coastline. Thank you for mentioning our wonderful staff, they are like family to us. We will welcome you back anytime! It started as a girlfriend vacation and it turned put to be THE PERFECT VACATION!!!!! We did nothing but relax and enjoy the beautiful house and it's surroundings!!!! No words can tell the beauty around the villa and the villa itself, we had so much fun and really that it's what we intended to do it all along! Thank you Janet, for letting us enjoy your house and by doing that we got to see and discover beautiful Vallarta!!!!! It was wonderful to have you and your friend as guests and that you appreciated and enjoyed our home. As you expressed so well, Villa Serena is special, words and pictures can not capture the real experience. We look forward to your return!